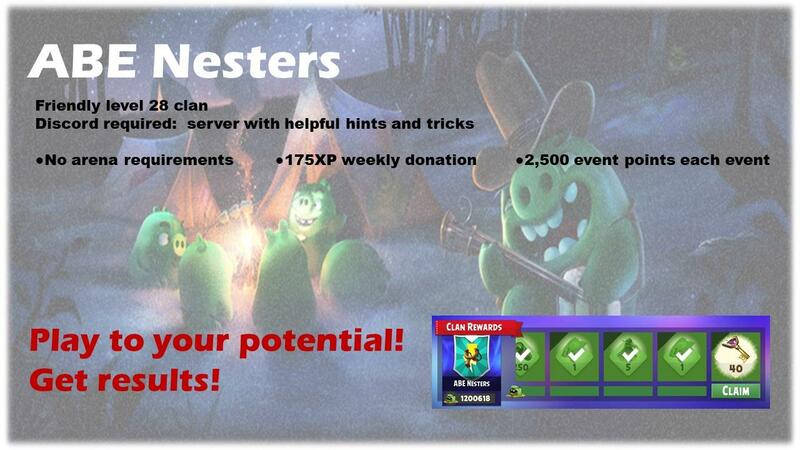 Once the event ends, ABE Nesters, a clan born here on AngryBirdsNest, is looking for an active player who wants to achieve all clan rewards. Post here for an invite. And we are full for the next event! We’ll post again when we have more openings. Hey, my leader decided to kick someone, so I have room and am sending an invite. Hello there! 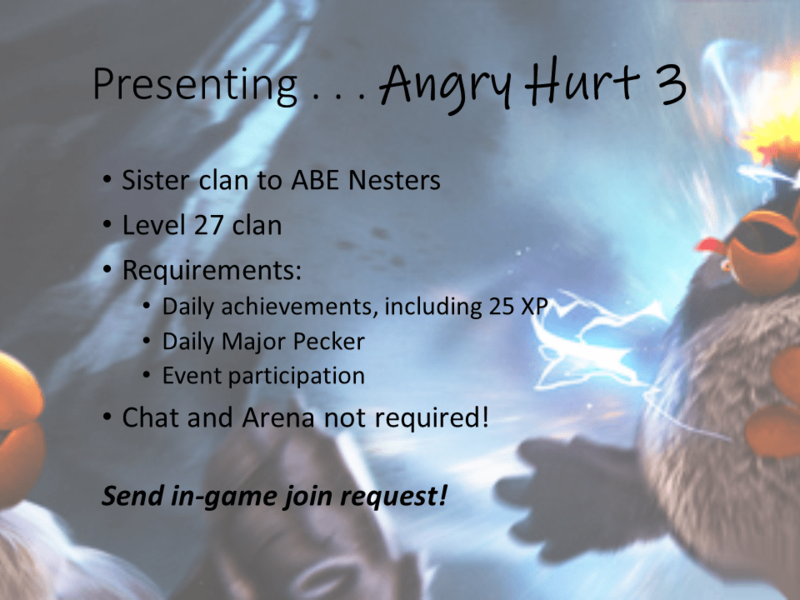 We’re full up in the main clan, but I will send you an invite to our second clan, Angry Hurt 3. We move folks from Hurt to ABE Nesters as space opens up. It’s still an event-focused clan, but we’re growing it, so it has fewer members. You caught me sleeping! Left you a message on the discord recruiting server. Come help us rebuild Angry Hurt 3! 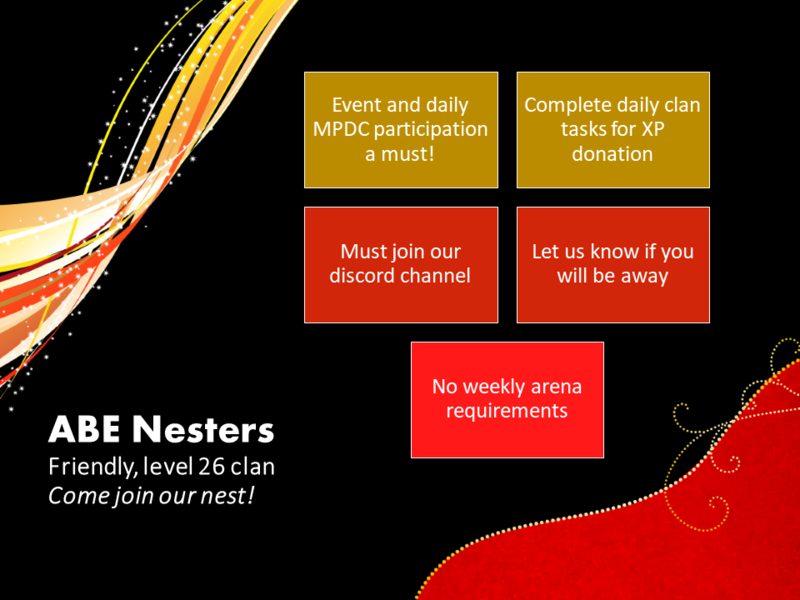 Sister clan to ABE Nesters; no minimum level, chat, or arena requirements. Send in-game join request! Thanks for your interest in ABE Nesters. We would be happy to have you both, but are full at the moment. We will post again when we have openings to fill. Great! You’ll see an invite in-game shortly, and I’ll wait until Tuesday to send you a discord link, as they are only good for 24 hours. 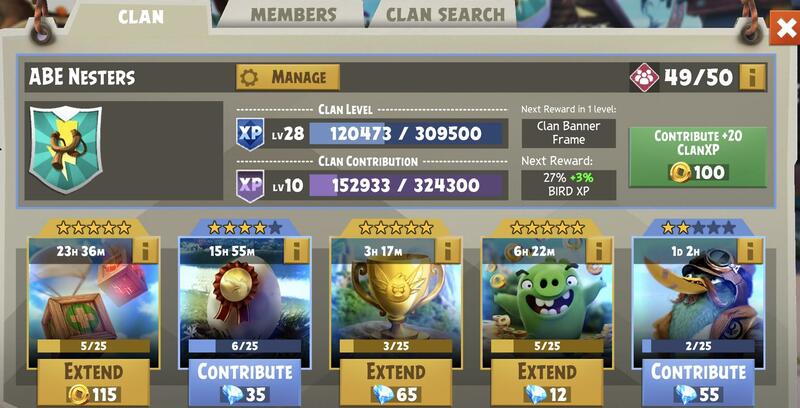 Be sure you grab the clan rewards once you join us – there’s a new bird coming Wednesday, and you’ll want the tickets (especially that gold) for it. 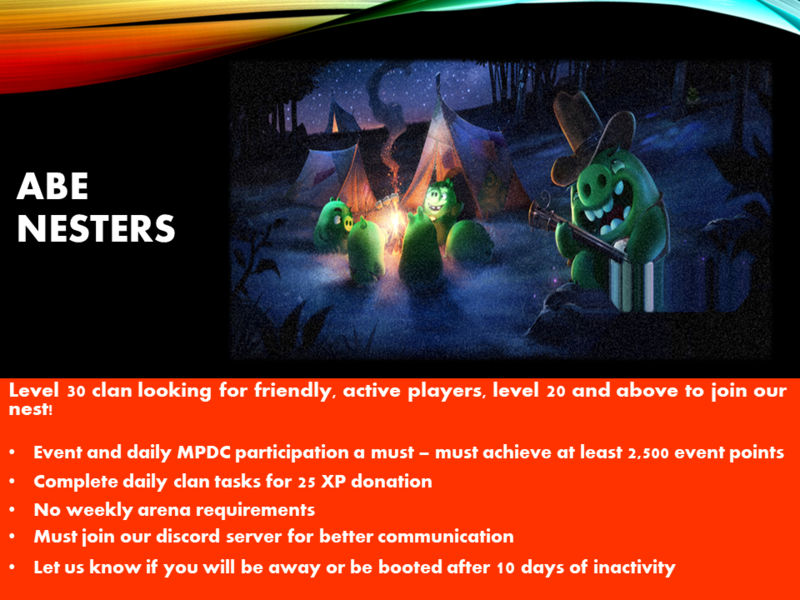 We’re looking for one new player to join our friendly, laid-back clan that achieves all event rewards. Must be willing to join our discord server! You can leave your in-game name here or join our discord recruiting server at: https://discord.gg/cJr3PHG. We do not accept in-game requests! We made room. Expect to see an invitation shortly. One thing I have to tell you is that we require that you download and use discord, a chat app, for better clan communication. Would that be an issue for you?